I’m a great believer in supporting contemporary glassmakers and artists where I can. After all, they’re creating the treasures that future generations will treasure. Visiting Belfast to film for the Antiques Roadshow at the Stormont Parliament Buildings late last year, I managed to find some time to visit the city’s historic St George’s Market early on Sunday morning. 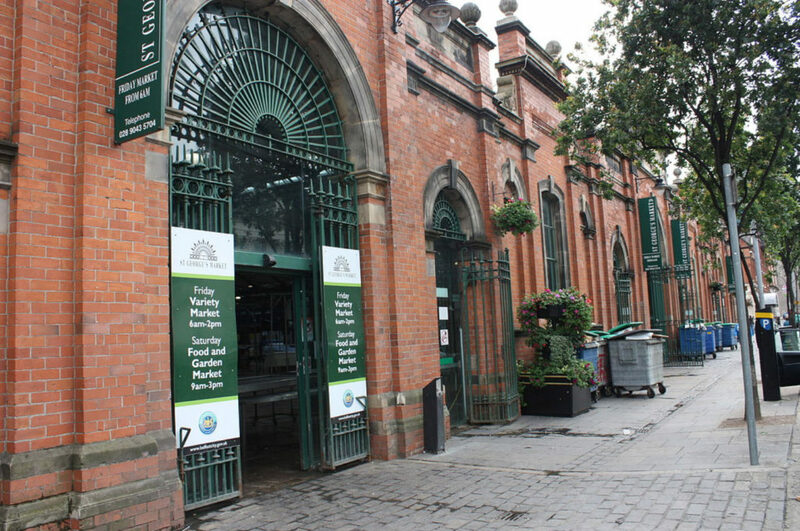 Although the beautiful late Victorian brick and cast iron building was mainly filled with stands that would make a foodie’s heart skip a beat and tantalise their tastebuds, there were a couple of stands selling antiques and contemporary artworks. Amongst them, my eye was caught by an interesting display of glass using traditional techniques based around internal coloured glass canes. On the Venetian island of Murano, this type of glass is known as filigrana, and it was there that the technique was developed in the 16th century and popularised into the 20th century. Today it’s used across the world by studio and factory glassmakers. What grabbed me first were the simple, sculptural forms that echoed the linear nature of the filigrana technique itself. I also liked the way that the forms echoed traditional Venetian examples of the early to mid 20th century, but still seemed so fresh and contemporary some five or six decades later. I asked the standholder whether she had made them, or where she had got them from, and she explained that they had been made by a Northern Irish glassmaker called Scott Benefield. She knew him and had bought a large selection of his experimental work the previous year. Interesting! When I got home I did some research and found that Benefield had founded his glass studio, BTU Studio, with fellow glassmaker Andrea Spencer in Randalstown in Northern Ireland in 2011. Naturally I emailed him, keen to learn more about him and my new acquisition. 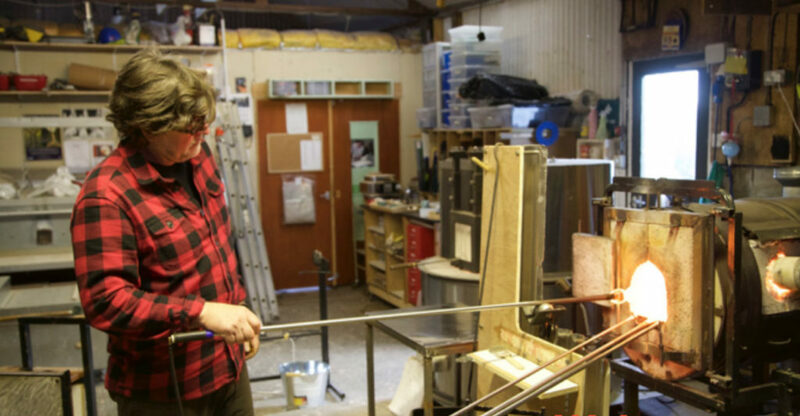 Benefield is fascinated by and highly skilled in the filigrana technique and has taught it at Pilchuck and Corning, and across the world from Turkey to Japan. The work of the esteemed Venini factory is a particular fascination. He told me that my piece had been made around 2011, and was an experiment in pattern generation that wasn’t intended for exhibition, and so was never signed or dated. It was made by elaborating the typical cane technique where drawn canes are usually fused together on a colourless sheet or glass in the heat of the furnace. Here, a number of separate roundels of colourless glass were made using this technique and then cut into square tiles after cooling in the lehr, almost like large murrines. 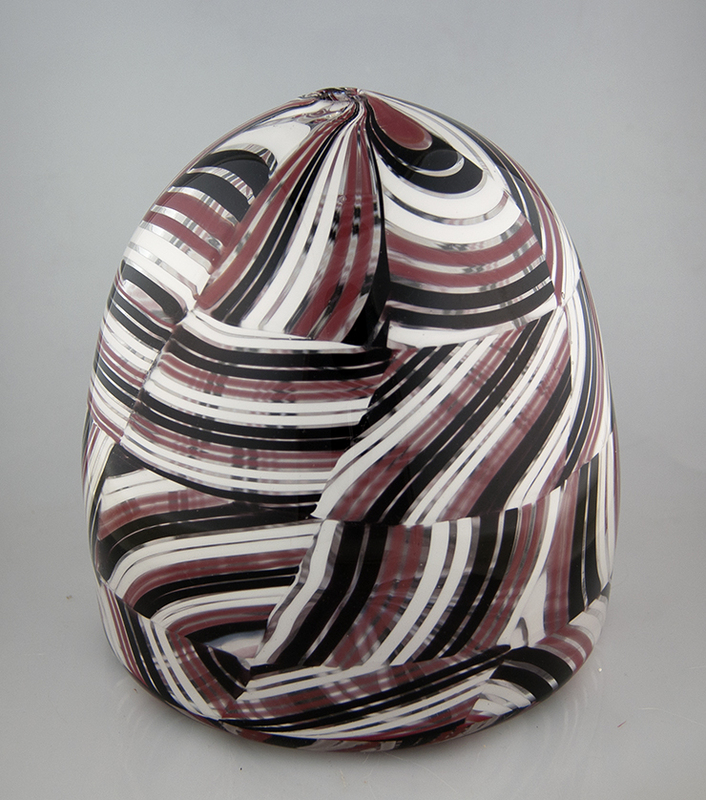 These are then heated, fused together and rolled up before being shaped – here into a dome. Apparently Benefield wasn’t satisfied with the density of the red, which takes on pinkish tones when put against light. Personally, I disagree, as glass comes to life and varies greatly depending on the type and strength of the light. During the night it’s a deep red, but during the day when sun streams in through the window behind it, it takes on delicate pink tones. It may not have been what he intended, but it works – certainly for me. 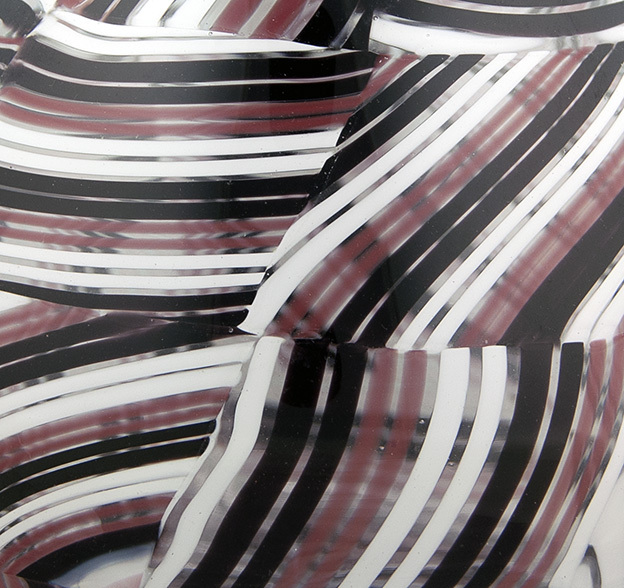 Shortly after making it, Benefield stopped using colour in his work, resorting to simple white canes on colourless glass, making this a captured moment in time during this glass artist’s career trajectory. Now I just need another trip to Northern Ireland to ask him to sign and date it! This entry was posted in Blog, Collecting, Glass, Shopping, Travelling. Bookmark the permalink.